Tomorrow is Monday, the start of a new work/school week for young and old. The alarm will buzz, vibrate, rattle or serenade us into the awaiting day where the mantra is RUSH, RUSH, RUSH! And for many, the Sunday dread of the pending week has already begun to dampen spirits. Does it have to be this way? What causes all advance weariness? is it true that TIME is immutable, that is to say, ‘fixed and unchangeable’? 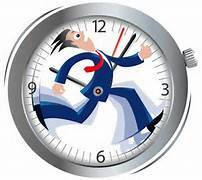 Do we really have only so many minutes and hours to do ALL that we want to/have to do? is there something called MY TIME. If this is so, where do we get this TIME? Does it come to us by virtue of being born? is it up to us to decide what we have to do or want to do? and just what exactly IS TIME after all? When the disciples were rowing across the Sea of Galilee in a storm, Jesus came walking across the water toward them. Here are a couple of lines in John’s gospel: Chapter 6:20-21 But he said to them, “It is I; do not be afraid.” Then they were glad to take him into the boat, and immediately the boat was at the land to which they were going. Then there is Joshua in the Old Testament. The successor to Moses, he prayed to God for His supernatural intervention, as recorded in Joshua 10:13 So the sun stood still, and the moon stopped, till the nation avenged itself on its enemies, as it is written in the Book of Jashar. The sun stopped in the middle of the sky and delayed going down about a full day. If God has created everything/all things, then that ‘ALL’ includes both the material and the immaterial. 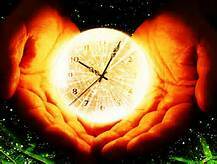 TIME certainly fits in the category of immaterial. We can’t see it, but we measure it by material things that God has created, like the sun and the moon and Earth’s relative position to the stars. I’m beginning to see my presumption and small-mindedness in believing that the God who creates TIME is constrained by how I, a creature, count TIME. If all this is so, maybe you and I can STOP rushing around. Maybe slowing down to smell the flowers and marvel at God’s creation can become our norm. Just maybe welcoming ‘interruptions’ as opportunities to demonstrate our trust in God’s sovereign control over TIME can become our new MODUS OPERANDI for 2015. PS: Who might be our actual ‘enemies and persecutors’? The most influential earthly influence for me to slow down is Fred Rogers. Also known as Mr. Rogers. I used to watch his program when my kids were young and I was struck by the very slow pacing of his speech and activities. It isn’t natural to me- my mother was a 6:30 AM Saturday morning “let’s vacuum” type of taskmaster. I love the feeling of checking off tasks I’ve done, because maybe if I’ve checked off more than the next lady, I’m better than she is. Right? Wrong. That’s when Mr. Roger’s giant head drops down from the ceiling of my mind and says, “Whoa there, sister. What’s your hurry? Think you are getting off this planet alive?” Well, Mr. Rogers wouldn’t talk that way, but that’s how I hear him. I still rush around, make myself have stomach aches, and irritate others in my rushing. But it’s nice to have a role model and reminder that I’m choosing this. It isn’t being forced on me. And what kind of nincompoop volunteers to act like that? Come to think of it, I’m going to have a glass of port and read a slow book. Mary – thanks for your thoughts about Mr. Rogers – I like how you invoke what he might say! Have you downloaded the Ask Pastor John app – he responds to a question from ordinary people like us. Spends about 5-7 minutes answering 1 question a day Monday – Friday. Very practical stuff. I’m interested in your take on “enemies and persecutors”! Trish – I think some of my enemies might be of my own creation!